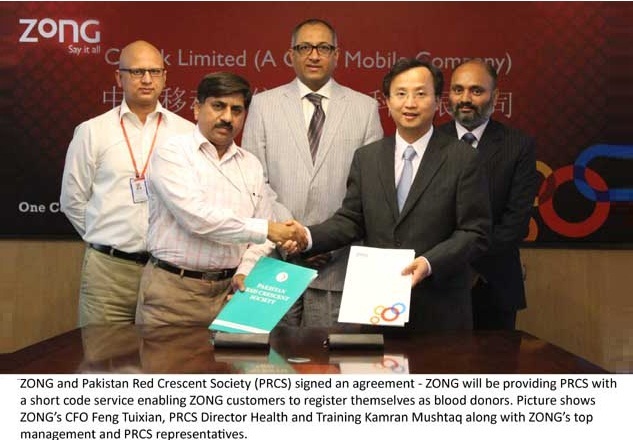 In one of its kind collaboration ZONG – the digital partner of the nation will be providing Pakistan Red Crescent Society (PRCS) with a short code service through which ZONG customers can register themselves as blood donors by sending “reg” on 2258 after which they will be contacted by the Red Crescent in time of need. [blockquote cite=”Mr. Feng Tuixian, CFO, ZONG”] It is an honour for us to be a part of this noble cause. Most of us don’t realize the importance of having healthy blood cells but for those who need it in case of blood diseases and accidents know the value of this lifeline.